In this lesson you will learn how how to design and build your own custom reports. Advantages of Using Custom Reports. Selecting Valid Combinations of Dimensions and Metrics. Designing and Building Your Own Custom Reports. Custom Reporting is a feature introduced by Google that allows you to develop tailored reports by choosing appropriate pairs of dimensions and metrics. Quicker access to the information you want to see, the way you want to see it. Build reports to suit your business needs. Less switching from one report to another. Bring relevant metrics and dimensions from multiple areas of Google Analytics into one place. Relevant drilldowns, break visitor behavior into workable segments which are more relevant to your business model. Share the right things with the right people. By using the tab feature in custom reports your colleagues can see only the data that is relevant to their activities. Google defines a metric as a quantitative measure of how visitors interact with your site. Examples of metrics include; the amount of time visitors spent looking at a page (time on page), the number of times visitors viewed a page (page views), etc. Dimensions are attributes or characteristics associated with visitors on your website. Dimensions are the categories that the data in your reports fall under. A few examples of dimensions are, medium (organic or direct), region or source, etc. Tips: Metrics are always expressed in numbers and dimensions are always expressed in words. 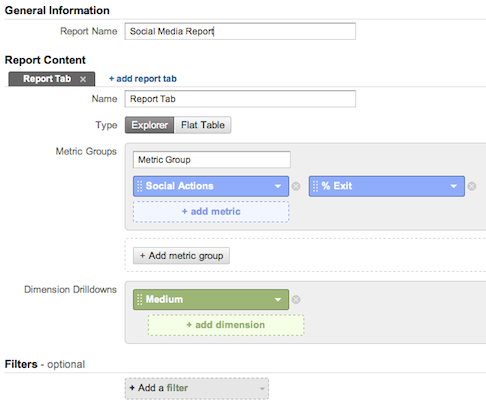 Unlike dimensions, you can build a report using only metrics. You can choose any metric to build your custom report. You also don't have to pair them with dimensions, which means there are no restrictions to which metrics you can use. When paired with dimensions, metrics are subject to certain restrictions. Invalid combinations won't be accepted by the Custom Reporting feature. Google has categorized certain metrics and dimensions into groups. If you want to select dimensions or metrics from two different groups, your options are limited. Have a general outline of how the data should be presented in your reports. (Build a table). Select the appropriate pairs of dimensions and metrics. Ask yourself, what kind of dimensions you want to categorize the metrics into? Create a test report so that you can see how the report will look once it's completed. Select the account you want to create a custom report in. Click Custom Reporting tab from the top right view of the Google Analytics window. Select on + New Custom Report. Note that you can also set categories of custom reports for viewing ease as well. You will now be taken to the Create Custom Report page. Name your report up top of this page. You can now click and add each metric on the blue dotted fields labeled metric. To undo any selection, simply click X on the top right corner of the metrics key. You can now click and add each dimension on the blue dotted field labeled dimensions. You are allowed to have up to four sub-dimensions to drill down to. You then have the option to add in any filters, as desired as well. 1. You would like to see visits, pages/visit and bounces categorized by mediums into one single report. You want this report to have the ability to drill down through this information in reference to countries and cities. Create this report using custom reports. Select the account you want to create a custom report in (e.g RemoteCourse). Select any profile you wish and click on Custom Reporting tab. Click through and add metrics (Visit, Pages/Visit, Bounces) into the blue dotted fields labeled metric. Click over to Medium as your top level dimension into the green dotted field labeled dimensions. Click and add Country and City as your sub dimensions. Click on Test Report to do a test run. Click on Save Report to complete the process.